Mexican quesadillas are very easy to make, and kids love them since they contain a lot of cheese (with some health vegetables snuck in there, of course)! 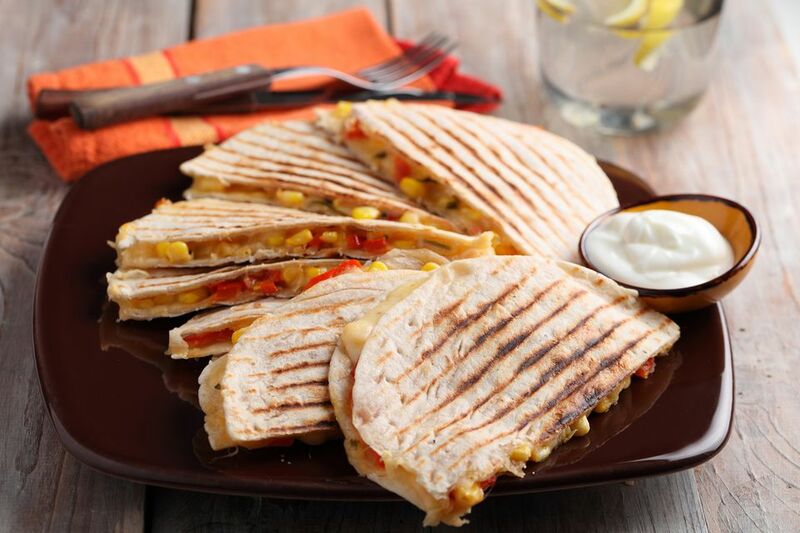 This vegetarian recipe for a simple cheese and bell pepper quesadillas will be a hit with the kids, as well as the adults, and veggie quesadillas also make a great snack or a simple appetizer for the Super Bowl, or any game day. You might also love having some sour cream, homemade guacamole, and salsa on the side to dip your veggie quesadillas in. These bell pepper veggie quesadillas are also oven-baked instead of pan-fried, which gives them nice crispiness, without any added fat or oil when cooking. Although the recipe does call for cooking the bell peppers in a bit of oil before baking, you can omit the oil and use a non-stick pan, or, omit this step entirely if you prefer your veggie quesadillas to be lower in fat. You can make these Mexican quesadillas vegan if needed by using vegan non-dairy cheese, and, to make them gluten-free, swap out the regular flour tortillas for a gluten-free wrap. Wondering about cheese and whether it can be included on your vegetarian diet? Here's what you need to know about whether or not cheese is vegetarian. First, pre-heat the oven to 375 F and lightly grease a baking sheet (depending on the size, you may need two baking sheets or to work in batches). Next, add the oil to a large skillet over medium heat and cook all of the green, red and yellow bell peppers in oil. While the peppers are cooking, add the cumin, sea salt or kosher salt, a bit of fresh ground black pepper and the lime juice and cook just until peppers are just soft, about 3 to 5 minutes; do not overcook. Place four of the flour tortillas flat on a lightly greased baking pan to assemble your quesadillas. You may need two baking pans for this. Place a large spoonful or a thin layer of peppers on a flour tortilla. Add a thick layer of cheese and cover with another flour tortilla, and assemble all of the veggie quesadillas in the same manner. Bake your bell pepper quesadillas at 375 F for about ten minutes, or until the cheese has fully melted. To serve, slice each quesadilla into fourths or, cut 6 pie pieces, like a pizza. Top with salsa, sour cream or serve with guacamole on the side if you'd like.